I want to thank Stephen Curry for ruining my sleep. I've been up late throughout the NBA playoffs watching all of these 10:30 p.m. east coast starts for Curry's Golden State Warriors, and I suspect a few of you reading this have, too. Curry is slowly making the Golden State Warriors a national team. He's making me stay up to 2 a.m. on weekdays. Golden State played Game 5 against San Antonio Thursday and the Spurs' 109-91 win ended at 12:06 a.m., which is early for a Warriors game. Game 6, where the Spurs can end the series, will tip off sometime after 10:30 p.m. Thursday night on ESPN. While the NBA playoffs may've been Chicago Bulls' guard Nate Robinson's at the start, they've definitely become Curry's coming-out party as the pro sports league's annual tournament has moved on. No question, if there's a singular star of the playoffs so far, it's been the former Charlotte Christian and Davidson star, raining one-legged 3-point shots and making left-handed no-look passes. In his home market in Northern California, ratings are through the roof. 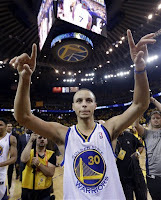 Comcast SportsNet Bay Area posted its highest rated Warriors telecast ever for a Game 6 first round win over Denver. The Sports Business Journal reported that, locally, the Warriors jumped 92 percent in TV viewership this year, giving them a 2.90 per capita TV rating. That's right behind NBA stalwarts New York and Boston in their markets. Nationally, Golden State is getting ESPN "SportsCenter" and "First Take" run, and it's not because the hosts are taking shots (see Bobcats, Charlotte). Because of a conflict at the United Center that pushed Heat-Bulls Game 4 to Monday, Golden State even landed on prime time Sunday afternoon national TV Sunday. Going against Tiger Woods winning the Players Championship, Game 4 of Spurs/Warriors drew a 4.1 overnight rating for ABC, which was down 31 percent from Heat/Pacers Game 4 in 2012. But hey, Tiger was in the hunt Sunday and Golden State just hasn't been on center stage that much (and playing the rather boring Spurs probably didn't help, either). Still, the fact that Golden State is on prime Sunday afternoon television at all is a shock. When was the last time that happened? Maybe when Chris Mullin-Tim Hardaway-Mitch Richmond -- a trio nicknamed "Run TMC" -- was the NBA's highest scoring trio in the 1990-91 season. The Warriors can thank Curry for a lot of this attention. He's doing for Golden State what he did for Davidson -- take a sports team that no one knows much about or cares much about and put them in the conversation. And in doing so, Curry is becoming a bona fide star. You can now make a case that, with the Lakers in decline and the Spurs aging fast, that Golden State is going to be a Western Conference contender for years. And I don't think Curry is going to be taking a vacation during NBA All-Star Weekend anytime soon. I also suspect his home life is going to change some, too. I bumped into him at Harris Teeter and Chick-Fil-A last summer and I did an interview with him at Accelerate Basketball, one of the city's best training facilities. Curry was able to be out in public and not get bothered too. I don't think that will quite be the case now. His basketball camp at Charlotte Christian last year was a roaring success, but I wonder if his two events this year at Christian -- a June 24-27 skill session and a July shooting clinic -- are not going to enjoy a, um, sight increase in participation. Everybody's going to want to be with him this year. Love the Curry story, he's a bonafide star...and he is someone that is easy to root for, and an added bonus that he's a Charlottean making us all proud. As an NBA fan, especially of the 90's decade, I just have to correct you on one point you made in the article. Golden State's Run TMC team of the 90's did not include Chris Webber, he wasn't drafted until the mid 90's and he's much younger than Mullins and Hardaway. The Run TMC team you speak of consisted of TIm hardaway, Mitch richmond and Chris Mullins.....not Hardaway, Mullins and Webber. Great article, despite this 90's NBA error. Have enjoyed the games with Curry. I hate it that they lost last night. I am sure Curry is ready for some rest.